Tomorrow we meet our family. The parents are Fany and Fabian. Fany works in a health clinic, Fabian is a laborer. They have two children Ester (9th grade) and Fabian (kindergarten). We can’t wait to meet them. We had our orientation this morning. Lempira means “Lord of the Mountains” We got Habitat Honduras shirts and hats! The shirts say Somos albaniles which is the quote made famous by the newly Sainted Bishop Oscar Romero from El Salvador. We then did a walking tour of the City. We visited 3 of the 4 churches. San Sebastián, San Marcos, and Santa Lucia. Then we went to Parque Nacional Celaque. There are 287 different species of birds. We then went to Fuerte San Cristobal (Fort)it is just above our hotel. Tonight after dinner we’ll go to mass at one of the churches we visited earlier today! Jose joined us this morning. He shared all the Honduras stats with us. They annually build 2000 Housing solutions. 500 are new homes. They have 20 global village teams. 10% comes from Global Village teams. The average monthly minimum wage to qualify for Habitat is $400. 25 % of the population here has no access to water. Today we traveled to Gracias Lempira via Lake Yojoa where we stopped for lunch for some amazing fish grown in the lake. They made pickled onions and cabbage to eat with the fish and plantains. 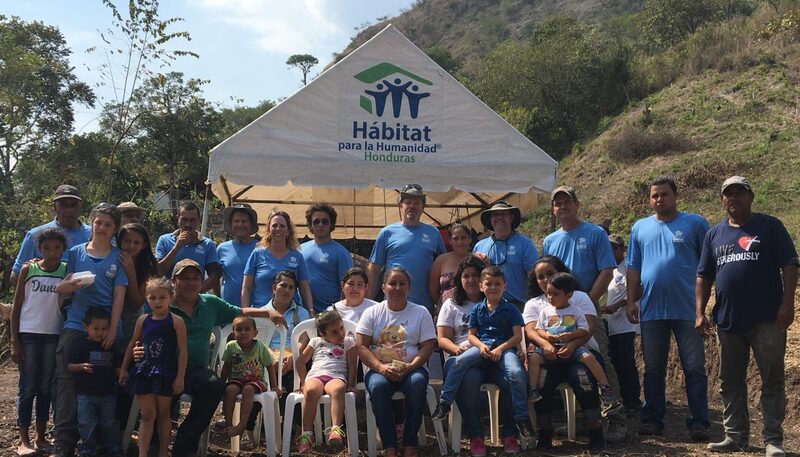 In Puerto Lempira, 184 homes have been built by Habitat. We had dinner with Alex from the Rotary club. San Pedro Sula is beautiful at night. Alex was such a pleasure to share dinner with. Today we arrived in San Pedro Sula and met Maria Marquez from Habitat Honduras. We are staying at Gran Hotel Sula. Across the street is the Cathedral and a #sanpedrosula sign that is very colorful. Donate to help families like the Miranda family…. We’re ready to head to Houston in our Habitat blue shirts!! Soon we’ll be in Honduras. Special Thanks to Marshall for our airport shuttle!!! Donate to help families like the Bobadilla family….click here !